Strawberry Fields is an organic oasis ten miles north of Boston, Lincolnshire. Started as a self-sufficient dream back on a housing estate in Hertfordshire, the inevitable bills were an incentive for Pam Bowers and family to begin selling the surplus vegetables (organic of course), and one thing led to another! The business is a real family concern, with sons Clyde and Dicken second generation organic farmers, daughter Bryony responsible for the payroll, and eldest son, Jade, drawing up the end of year accounts. They have been farming organically since 1975, clinging on tight through the organic roller-coaster of three decades – and through some tough times – cutting their own niche on just 38 Black Fen acres. Because she wanted to keep her hands dirty and her feet very firmly in the soil, Pam chose not to go down the retail route, but to supply wholesale, to shops (like us), restaurants, and a number of box schemes. Strawberry Fields’ cropping programme runs up to 80 ‘inspirational ingredients’ – look for lettuce, celery, pak choi, herbs, etc. in Strawberry Fields packaging (in season) and their vast display of squashes in the autumn. The environmental sustainability of the farm is evident from the snake eggs in the manure pile, the frogs in the celery field, the family of weasels playing beside their own-established hedgerows, the goose nesting in the spinach, and the young leveret who regularly turned up as they harvested lettuce. 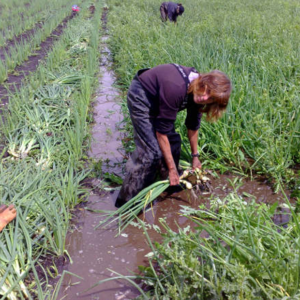 Pam writes; ‘I do enjoy the forum of newsletters and snippets on websites like this to foster an understanding – for instance, if leeks have been harvested in subzero temperatures, the sample may be scruffy. With a chance to explain the problem of peeling them back with frozen fingers, we have a chance of the customer being on our side’. Strawberry Fields were awarded Grower of the Year at the Select Lincolnshire Food, Drink and Hospitality Awards in February 2014. Check out their great website.